A recent article by journalist Molly Osberg gives an excellent overview of the psychology of conspiracy theories, including a few quotes from me, among other researchers. 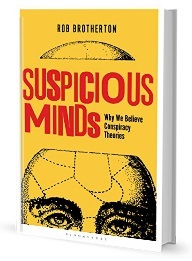 “There’s not that much of a difference, really, between conspiracy theorists and the rest of us,” says Rob Brotherton, whose exhaustive book on the subject of conspiracy theory psychology, Suspicious Minds, is out next month. According to the author, who holds a PhD from the University of London and currently teaches at Barnard, the qualities that make people believe the truth is out there “are things we all suffer from … They’re biases that are built into our brains,” whether they affect how we remember meeting our partners or whether we think Osama bin Laden is really dead. Click here to read the full article on Vice Motherboard. This entry was posted in Biases & heuristics, Suspicious Minds and tagged conspiracy theories, heuristics and biases, politics, psychology, Suspicious Minds. Bookmark the permalink. What nonsense we actually research stuff, you make it up, our is fact yours is theory. Having read most all of the articles here on this site, I am afraid I have to agree with Ray here. Your framing of “conspiracies” as empty implausible theories, is in fact nothing but an implausible theory itself.